Context: Some of the coastal parts of Kerala are well-reported high background radiation area. Hence, the radiological protection of the population in this region has of great concern. Aims: In view of this, a study has been undertaken to understand the distribution of radon (222Rn) concentration in drinking water collected from the region. The seasonal variation of radon concentration in drinking water also forms part of the study. Assessment of whole-body dose and excess lifetime cancer risk (ELCR) to the public were also done. 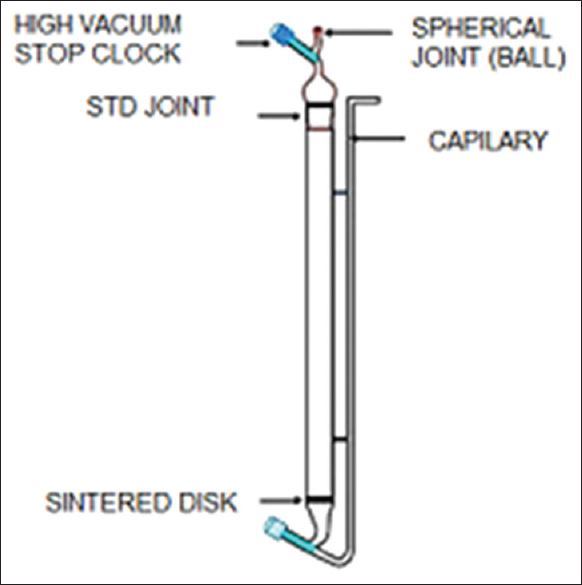 Subjects and Methods: Emanometry method is followed for the quantification of dissolved radon concentration in water collected from various open wells. Results: Average value of ELCR at different locations is ranged from 0.009 × 10−3 to 0.123 × 10−3. Conclusion: The average value of effective dose was below the recommended limit of 0.1 mSv/y suggested by the WHO and the EU council. The present study indicates that water from the region can be safely consumed from the radiological protection point of view. All the results are presented and discussed in detail in the manuscript. Aims: The present study was aimed to assess the impact of stem cell sparing radiation therapy on the outcomes of the treatment in glioblastoma multiforme (GBM). Materials and Methods: The present retrospective study was done in the Advanced Center of Radiation Oncology Department of Nanavati Super Speciality Hospital, Mumbai. All case files from 2010 to 2016 having confirmed diagnoses of GBM were retrieved for assessment. 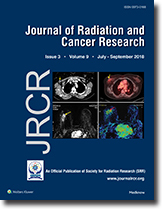 Totally 46 patients were included in the study and divided in intensity-modulated radiation therapy (IMRT) group and non-IMRT (three-dimensional conformal radiation therapy [3DCRT]) group. Twenty-eight patients received IMRT and 18 patients received non-IMRT (3DCRT). All patients receive total dose of 60 Gray (Gy) in 6 weeks and 30 fractions after tumor resection with temozolomide. Results: It has been observed that the mean age was 58.5 years in IMRT group and 54.4 years in non-IMRT group. Gross-total resection or near-total resection was performed in 7 (25%) of patients in IMRT group while it was 4 (22.2%) patients in non-IMRT group. Four patients in each group had only biopsy, while rest of them underwent subtotal resection. The mean dose to contralateral subventricular zone (SVZ) was 27.96 Gy in IMRT group and 32.60 Gy in non-IMRT group while dose received by ipsilateral SVZ was 47.19 Gy and 48.53 Gy in IMRT and non-IMRT group, respectively. Maximum dose to contralateral and ipsilateral SVZ was 49.29 and 59.53 Gy in IMRT group. Similarly, in non-IMRT group, dose to contralateral and ipsilateral SVZ was 45.5 and 59.14 Gy, respectively. The minimum dose received by contralateral SVZ was 9.1 Gy in IMRT group and 19.45 Gy in non-IMRT group while dose received by ipsilateral SVZ was 19.87 and 35.3 Gy in IMRT and non-IMRT group, respectively. The mean volume of contralateral SVZ was 7.68 and 6.62 cc, respectively. There is no statistically significant difference between both the groups for the mean dose to SVZ. The overall survival in both the groups was 19.22 months and median follow-up was 22.27 months. There is no difference in survival between both the groups (P = 0.66). A Kaplan Meier curves were generated using the facility in STATA 14.2. 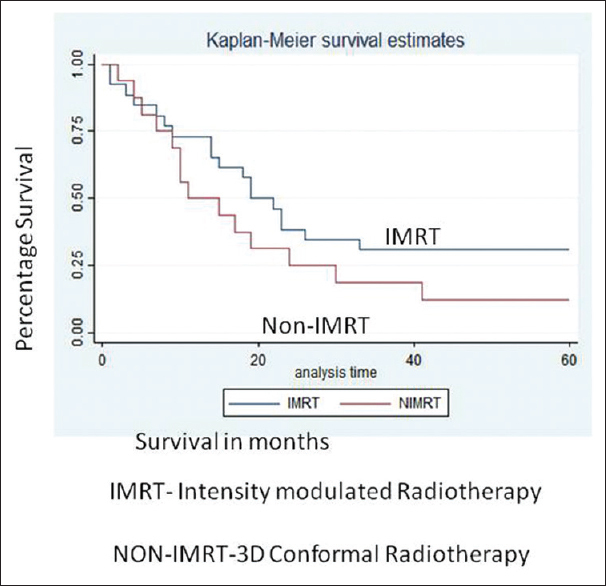 A cursory examination of the two curves, one each for IMRT and 3DCRT shows differences between the two treatments. However, the significance test, log-rank test, indicates otherwise. The chi-square of the test is 1.67 and the Pr > χ2 = 0.1960. Hence, the hypothesis that the survival from the two treatments do not significantly differ, cannot be rejected. Conclusion: Our retrospective analysis demonstrates no difference in overall survival between both groups. Hence, there was no impact of sparing stem cell on survival in GBM. Objective: Radiation-induced alterations in permeability of plasma membrane and associated apoptotic changes were investigated in apoptotic thymocytes induced by radiation. Materials and Methods: Immature mouse thymocytes suspended in RPMI 1640 were irradiated by γ-rays for desired doses up to 10 Gy and these cells were examined after incubation (up to 24 h) at 37°C. Radiation-induced changes in plasma membrane of thymocytes were determined by fluorescence technique using fluorescein diacetate (FDA) and trypan blue (TB) method. Induction of apoptosis in irradiated cells was determined using annexin-V as fluorescence probe method and measurement of cytosolic caspase-3 activity. Results: Radiation-induced apoptotic thymocytes showed an increase in membrane permeability as observed by leakage of FDA, which was poorly detected by TB. FDA could sensitively detect the dose-dependent variation in membrane permeability alterations in the range of 0.5–2 Gy incubated at 37°C. In radiation-induced apoptotic death, externalization of phosphatidylserine is an early event than caspase-3 activation. 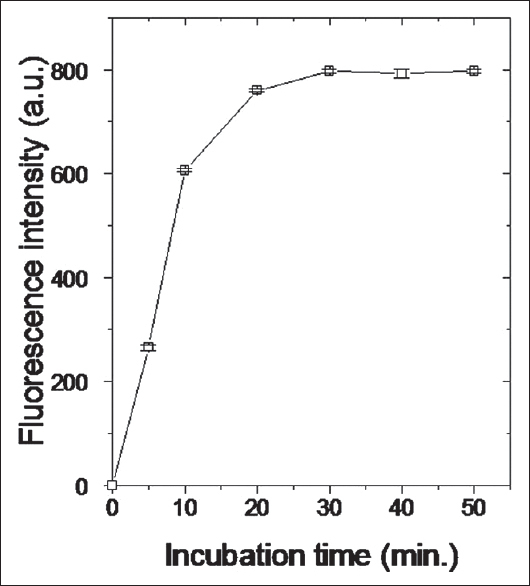 On incubation of cells, an increase in caspase-3 activity and proportion of annexin-positive cells was observed, which further increased after irradiation. Conclusion: Our results showed membrane permeability changes induced by γ-irradiation, which seem to be closely associated with the apoptosis in thymocytes. 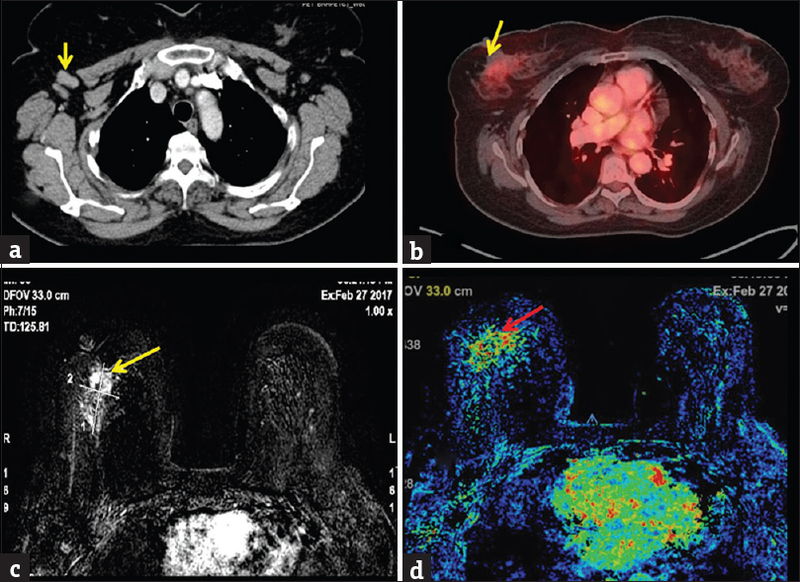 Occult primary breast carcinoma with axillary lymph node metastasis is a rare disorder accounting for 0.1%–0.8% of all the cases of breast cancer in females. Magnetic resonance imaging (MRI) of the breast detects primary tumor in nearly 70% of patients. We are presenting three cases of postmenopausal females, who presented with metastatic axillary lymphadenopathy and primary could be diagnosed only on MRI breast.